Author's Note: I am delighted to bring in a guest post written by my good friend, Trisha Ingram. Read on to find out what she thought of the book. Immediately when I saw this book I wanted to read it. Not because I was a huge fan, although that was the end result, but simply because I had seen TOMS shoes in Nordstrom and in a couple surf shops in California this summer and thought they were really cute. I was aware they gave shoes away, but that's it. 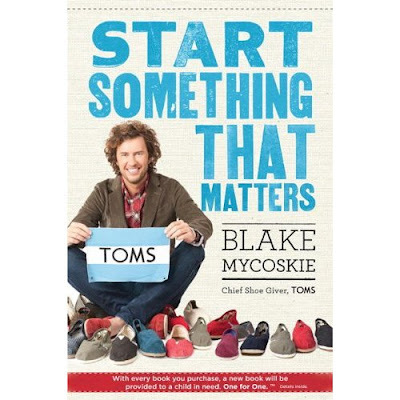 I was intrigued to know more about the company's background and how Blake Mycoskie came to start it. A friend encouraged me to read at minimum the first chapter, The Toms Story. But at the end of Chapter 1, I couldn't put the book down! Blake's experience compelled me to keep reading. I devoured the rest of the book in about two hours. The author does a good job of challenging the reader to ask reflective questions to search for what cause one would serve. Then he follows up with encouragement and recommended resources for everyone to use. He also explains that the foundation of building a company like this is trust. Trust internally with team members as well as externally with customers and the people they are committed to serving. I believe what we all love about this company is what it does for social justice. 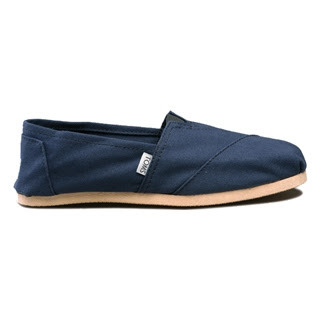 TOMS helps make things right in the world. And giving them our money for shoes helps us feel we are a contributor for change. It empowers us. I can recall many discussions in my MBA entrepreneurship class last year about the growing trend of social entrepreneurship, or as I like to call it, business with a purpose. Whether it be clean water drinking filters, mosquito nets, food shelters, or any other cause, people are waking up to the fact that what we do makes an impact in the world. And that it is possible, and respectable, to solve problems and still make a profit. In large part this book resonated with me because I am on my own quest to find a cause(s) that strikes me as much as it did Blake. Perhaps whichever cause I love will inspire me to start a for profit or not-for-profit business. Regardless, I want to do work I am passionate about. I want to make a difference, leave a legacy for those behind me. I believe this story of this book is a good example to helps others unlock a desire to make a difference. Trisha Ingram, MBA is recently new to the blog world and authors Cali Girl to Cowgirl, a blog about her experiences moving from California to Tennessee. She is actively seeking a new opportunity in Organizational Development. Connect with her on Twitter or Facebook. Disclosure of Material Connection: I received two books free from Blake Mycoskie I was not required to write a positive review. The opinions I have expressed are my own. I am disclosing this in accordance with the Federal Trade Commision's 16 CFR, Part 255: "Guides Concerning the Use of Endorsements and Testimonials in Advertising." Book giveaway contest: Instead of an online giveaway of Mycokie's book, my husband and I launched a giving project for teens called The Luke 21 Project. A group of high school students were given 2-dollar coins each and take time to look for someone to bless the money with. They have to record what they did and turn in the responses. The names of each participant were put in a drawing of a pair of TOMS shoes and a copy of Star Something That Matters. The results will be posted in a future blog post.